Another poker night, another treat for the guys. I was struggling coming up with something for the guys for the bi-weekly poker game. Cake is kinda hard to juggle with a beverage, cards, and a cigar. While they won’t turn down (free) cake they like cookies, brownies, and squares for ease of inhaling them. So I turned to food blog browsing for some ideas. I was thinking of lemon squares but when I saw blondies posted on Fake Ginger I knew I had to go with them. Something new to try and it will quickly be out of the house so I can’t indulge. We spent the afternoon of watching Syracuse lose their basketball game at a bar down town so Price had to go one way to get to poker on time and I went the other to bake. Once the blondies were done I grabbed them and threw them into the back seat- okay gently placed them, but off we were. I heard they really enjoyed them since they were still hot. The blondies were really easy to make. I use my stand mixer for everything but you can easily use a hand mixer to cream the butter and sugars and do the rest by hand with a wooden spoon or rubber spatula. Our evil little “oven” look soo long to bake the blondies. Maybe it is breaking again? I’m assuming that they normally do take 40 minutes and my hour was due to our oven’s need to act like an Easy Bake Oven. I’m sure you could make some substitutions with what kind of chips or nuts you use but I really think this recipe is spot on with the chocolate chips, butterscotch chips, pecans, and shredded coconut. Center a rack in the oven and preheat oven to 325. Butter a 9 x 13 baking pan and put on a baking sheet. Working with a stand mixer, preferably fitted with a paddle attachment, or with a hand mixer in a large bowl, beat the butter on medium speed until smooth and creamy. Add both sugars and beat for another 3 minutes, or until well incorporated. Add the eggs 1 by 1, beating for 1 minutes after each addition, then beat in vanilla. Reduce the mixer speed to low and add the dry ingredients, mixing just until they disappear into the batter. 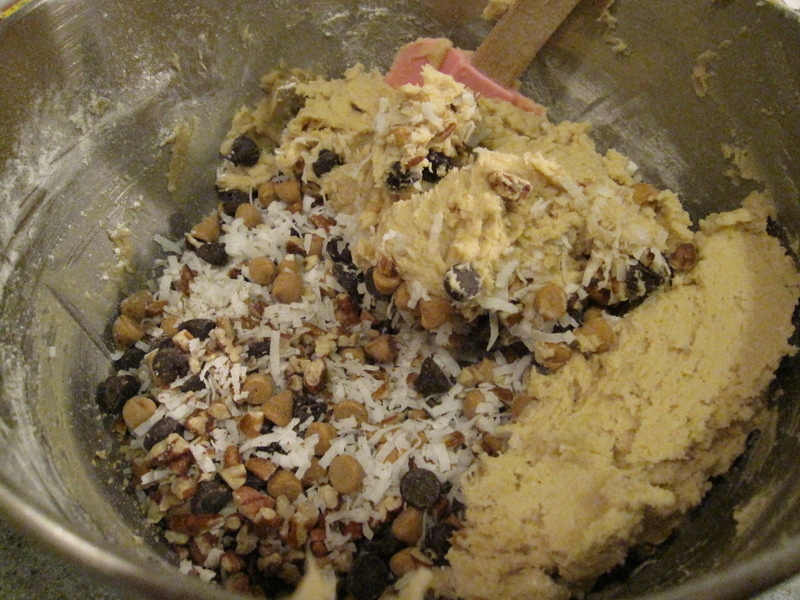 Using a rubber spatula, stir in the chips, nuts, and coconut. Scrape the batter into the buttered pan and use the spatula to even the top as best as you can. 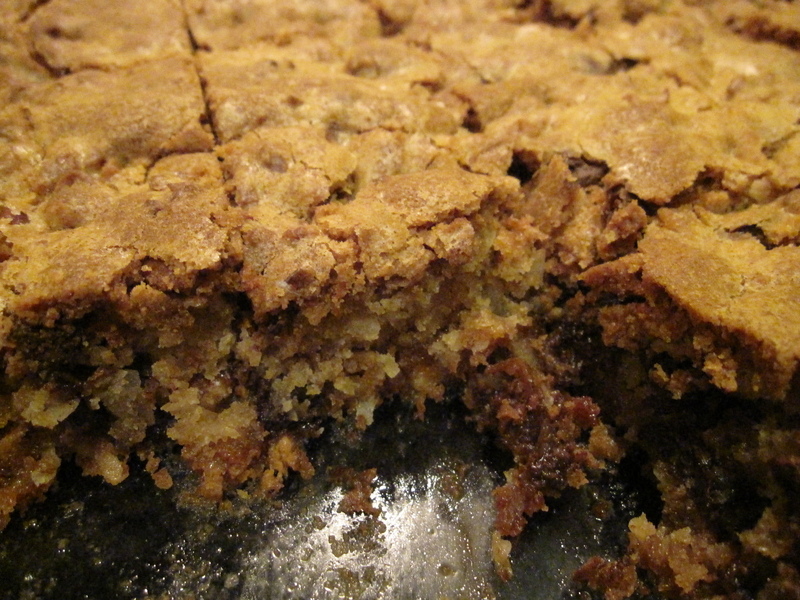 Bake for 40 minutes, or until a knife inserted into the center of the blondies come out clean. The blondies should pull away from the sides of the pan a little and the top should be a nice honey brown. Transfer the pan to a rack to cool for about 15 minutes before turning the blondies out onto another rack. Invert onto a rack and cool the blondies to room temperature right side up. Cut into 32 bars, each roughly 2 1/4 x 2 1/2 inches. Nom, nom, nom. Those brownies look fabulous! I bet they were a great poker snack! I wonder whats for next week? You do owe me a cake you know.